It contains lots of plant-based protein, fiber, and healthy fat and is a delicious and popular choice of dip, but is hummus healthy? The answer depends on how you eat it. If you have a decent food processor or blender at home, hummus is easy to make. If you’re a fan of Middle Eastern or Mediterranean cuisine, you’re probably already familiar with the creamy deliciousness that is hummus. 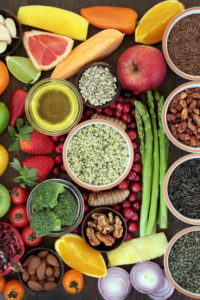 And even if you aren’t familiar with those cuisines, you’ve probably seen it served at parties or in restaurants and were somewhat curious about how it tastes and what it’s made of. You may have even asked yourself, “Is hummus healthy?” Let’s find out. 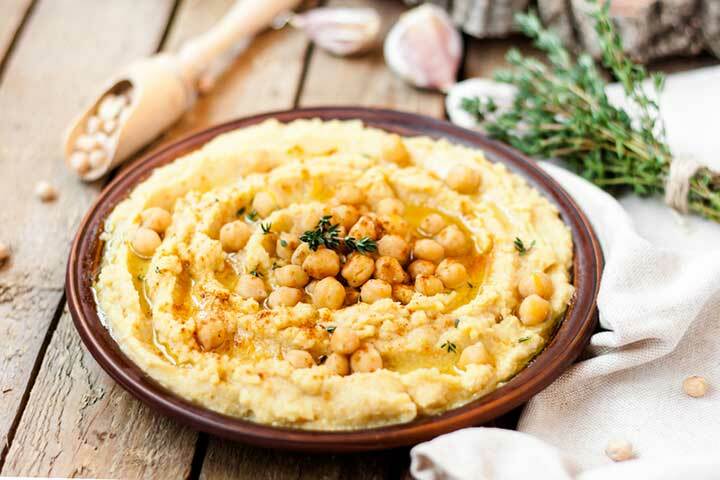 Hummus is a Levantine Arabic dip made of cooked and mashed chickpeas, tahini (a condiment made from toasted sesame seeds), olive oil, garlic, lemon juice, and salt. While the dip has been popular in the Middle East and the Mediterranean for centuries, it has recently gained popularity across the globe, including the U.S. Traditionally, hummus is served as an appetizer along with pita bread, falafel, meat, poultry, fish and/or vegetables. It’s often topped with various garnishes such as olive oil, parsley, paprika, sumac, olives, pickles, tomatoes and whole chickpeas. Hummus can also be used as a dip for raw vegetable platters that include carrot and celery sticks, and cucumber slices, and is sometimes used as a healthier alternative to mayonnaise on sandwiches and in salads. It’s also a popular choice of protein for those following a vegetarian or vegan diet. According to the USDA, two tablespoons of commercially made hummus contains 60 calories, 2 grams of protein, 5 g of fat, 3 g of carbohydrates, 80 milligrams of sodium, and 1 g of fiber. Each serving is free of sugar and cholesterol contains a good source of iron and vitamin C.
Chickpeas: Also known as garbanzo beans, chickpeas are a popular member of the legume family because of their high fiber and protein content. They’re often used as an animal protein replacement for those following a plant-based diet; they contain an adequate source of calcium, potassium, manganese, magnesium, zinc, vitamin K, and choline, which can decrease inflammation. Garlic: It contains allicin, which has anti-microbial and antibacterial effects, and can help treat hypertension, blood coagulation, and certain cancers. Olive oil: Loaded with healthy fats and antioxidants, olive oil is believed to help reduce inflammation, treat rheumatoid arthritis, prevent strokes and heart disease, and fight Alzheimer’s disease. Tahini: This condiment’s main ingredient is sesame seeds, which are a good source of zinc, calcium, phosphorus, fiber, and copper. Lemon juice: Lemons are rich in vitamin C, pectin, and d-limonene, which can benefit your heart and protect you from anemia, cancer and kidney stones. And like most foods in our diet, hummus should be eaten in moderation. Two tablespoons of hummus is considered to be one serving, which is a probably a lot smaller than what most people eat in one sitting. It’s more likely that we consume between two and three servings in one sitting, which can be a problem since many commercially produced brands of hummus contain more salt than the homemade variety. It’s also important to read the ingredients so that you can skip any brands containing colorants, thickeners, stabilizers, and preservatives. Is Hummus Healthy If I Make It at Home? Bell peppers for vitamins A, C, and B5. If you have a decent food processor or blender at home, hummus is easy to make. Just combine canned chickpeas that have been rinsed and drained with garlic, lemon juice, olive oil, and tahini and blend until smooth. Tahini is often located in the “ethnic” section of grocery stores, or in the condiments aisle. You can experiment with different types of legumes (beans, peas, and lentils) and flavor combinations. Go Thai-style by adding turmeric, coriander, cilantro, and curry powder, or spice it up with cayenne pepper, sriracha, chipotle, or your favorite variety of hot peppers. Check out BonAppetit.com for 20 different hummus recipes, some of which include unique ingredients such as avocado, beets, peanuts and sweet potato. And if you’re following a gluten-free diet, check out the sidebar below for a recipe from our sister publication Gluten Free and More. Here’s a tasty way to add nourishing, fiber-rich legumes to your appetizer tray. Serve this dip with strips of fresh vegetables or gluten-free crackers or chips. For all the flavor and nutrients at a fraction of the calories, try Gluten-Free Lean Hummus Spread; it can be made dairy free with good results. In the container of a food processor or blender, combine the garbanzo beans, tahini, garlic, olive oil, and salt, together with ¼ cup of the liquid from the garbanzo beans. Add lemon juice to taste. Blend on low for 3 to 5 minutes or until smooth, adding more liquid from the garbanzo beans, if needed. Each serving contains 48 calories, 6g carbohydrate, 1g protein, 2g fat, 1g dietary fiber. a gluten free diet, add, allicin, alzheimer, anemia, anti inflammatory, antioxidants, arthritis, beets, calcium, calories, cancer, cancers, cholesterol, choline, coriander, d limonene, dairy, diet, excess sodium, fiber, food, garlic, glucose, gluten, gluten free, gluten free and, gluten free and more, gluten free dairy free, gluten free diet, healthy fats, heart disease, hypertension, inflammation, iron, is hummus healthy, kidney stones, limonene, magnesium, nutrients, plant based diet, potassium, preservatives, protein, recipe, reduce inflammation, rheumatoid, rheumatoid arthritis, sugar, turmeric, vegan diet, vegetables, vegetarian, vitamin, vitamin a, vitamin c, vitamin k, vitamins, zinc. I thought you might be interested in this article on https://universityhealthnews.com: Is Hummus Healthy?